The Bauhaus masters on the roof of the building. 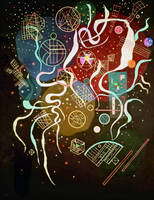 Wassily Kandinsky was born on December, 16th (4), 1866 in Moscow, in a well-to-do family of a businessman in a good cultural environment. In 1871 the family moved to Odessa where his father ran his tea factory. There, alongside with attending a classical gymnasium (grammar school), the boy learned to play the piano and the cello and took to drawing with a coach. "I remember that drawing and a little bit later painting lifted me out of the reality", he wrote later. 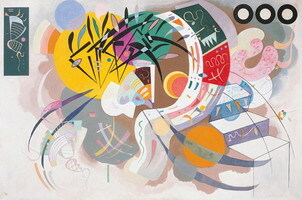 In Kandinsky's works of his childhood period we can find rather specific color combinations, which he explained by the fact that "each color lives by its mysterious life". However, Wassily's parents saw him in the future as a lawyer. 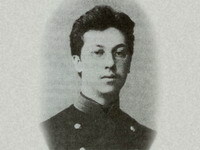 In the year of 1886 he went to Moscow and entered Law Faculty of Moscow University. 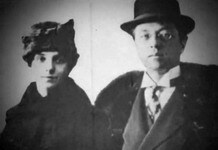 Graduating with honors, six years later Wassily married his cousin, Anna Chimyakina. In 1893 he became Docent (Associate Professor) of Law Faculty and continued teaching. 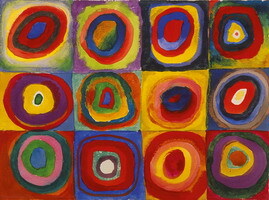 In 1896 the famous in Derpt University in Tartu, where at that time the process of russification was taking place, a thirty-year-old Kandinsky was appointed Professor to the Department of Law, but at this particular time he decided to give up a successful career to devote himself completely to painting. 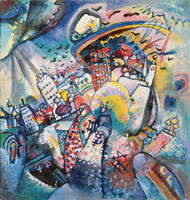 Later on Kandinsky recollected two events, which had affected this decision: his visiting an exhibition of the French impressionists in Moscow in 1895 and an emotional shock he experienced from K. Monet's, "Haystacks", and an impression of Rihard Wagner's "Lohengrin" at the Bolshoi Theatre. In 1896 he left for Munich, at that time considered to be one of the centers of the European art, and entered Anton Azbe's (Yugoslavian artist) prestigious private painting school , where he received the first skills in image composition, in work with line and form. However, rather soon the school ceased to satisfy his needs. Later the artist would write, "Quite often I yielded to a temptation to play truant and to go with a painter's case to Shvabing, to Englishen-Garten, or to the parks on the Isar". 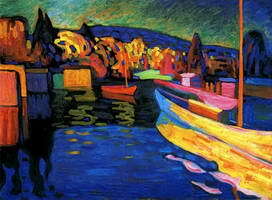 In 1900 after a failure of the previous year, Kandinsky entered the Munich Academy of Arts, and studied under Franz Stuck, "German graphic artist Number One". The master is happy with his student, but considered his palette too bright. 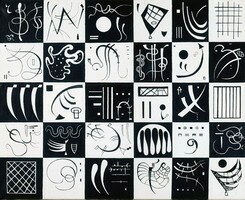 Meeting the Master's requirements, for the whole year Kandinsky drew exclusively in black-and-white spectrum , "studying the form as that". During that period Kandinsky got acquainted with a young artist, Gabriela Munter, and in 1903 he divorced his wife, Anna Chimyakina. The following five years he with Gabriela travelled across Europe, being engaged in painting and participating in exhibitions. Having returned to Bavaria, they settled down in a small town of Murnau at the bottom of the Alps. It was the beginning of the stage of intensive and fruitful search. The works of those years were basically landscapes, based on color discords. 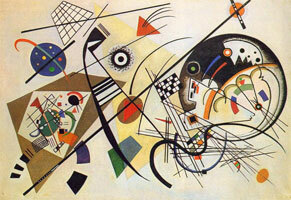 The play of color spots and lines was gradually superseding images of reality (Akhtyrka. Autumn. 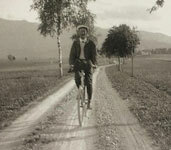 A sketch, 1901; Sluice, 1901; Old Town, 1902; Blue Rider, 1903; The Gulf Coast in Holland, 1904; Murnau. The Bailey, 1908). 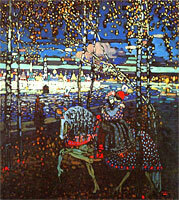 At that very time he turned to Russian fairy epic olden time, creating captivating images (Russian Rider, 1902; Russian Beauty on the Landscape Background, 1904), making mysterious legends about slavic wooden cities visible (Russian Village on the River with the Shallops, around 1902; To the City, around 1903). 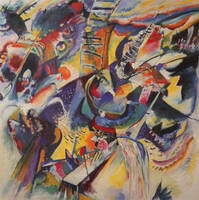 Kandinsky due to his active creativity and organizational skills always attracted anything intellectual, restless, striving, which was in the world of art of that time. Thus, in 1901 he founded Phalanx, an art group, in Munich and started a school, in which he taught himself. 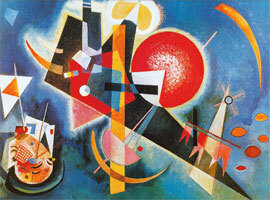 For four years Kandinsky had arranged twelve exhibitions of the painters who were Phalanx's members. 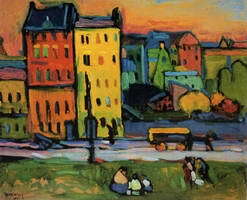 In 1909 he together with Jawlensky, Kanoldt, Kulbin, Munter and others, co-founded The New Group of Artists (Neue Kunstlervereinigung), Munich (MKUM) and became President. The Creed of the society is Not only does each of participants know how to tell, but as well they know what to tell. 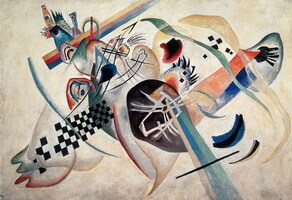 In 1900 Kandinsky participated in the exhibitions of the Moscow Partnership of Artists, and in 1910 and 1912 in the exhibitions of "Jack of Diamonds" art group. 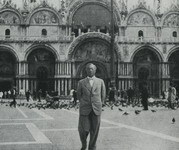 Besides, he published his critical Letters from Munich in the magazines The World of Art and Apollo (1902, 1909). 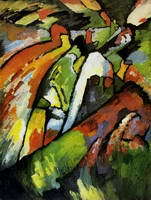 In 1911 Kandinsky together with his friend, Frantsem Mark, an artist, established a group called Blue Rider (Blaue Reiter). According to the artist, "the accent was made on revealing associative properties of color, line and composition, and they used various sources, such as Goethe and Phillip Runge's romantic theory of color, "Jugendstil" and Rudolf Steiner's theosophy". 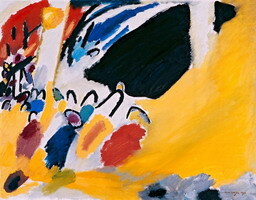 "There was no any other time when Kandinsky's painting develop as promptly as during the Munich years", wrote M.K. 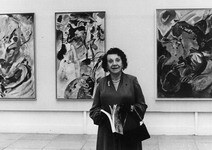 Lacoste, "At times it is hard to understand, why at the beginning the founder of abstract painting selected the plots typical for Bidermeierstyle - fans, crinolines, riders. The style of his works of the early period can be called neither conditional nor pretentious but in them nothing portended a radical renovation of painting. However, only few artists are known to have luck to show simultaneously originality in form and content. 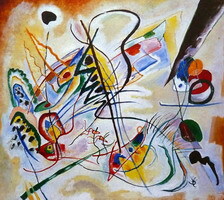 At first, it was important for Kandinsky to try his own opportunities of expression. Though one cannot but admit that Evening (1904-1905) has its own originality, however, it is difficult to imagine that it was created by the very artist who in five-six years would bring the first abstract work (1910) in history of art into the world. 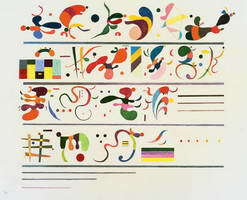 What a great creative force should operate in Kandinsky! 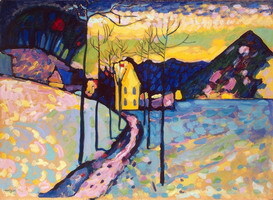 What prompt evolution from 1908 to 1914 - from landscapes, though bold already in color and form, but still true to nature, as "Houses in Murnau on Obermarkt" "(1908), up to a chaotic sketch called "Gorge" (1914) and restless compositions in a series of pictures "Seasons" in Guggenheim's Museum (Autumn). 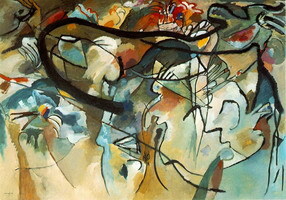 It would be difficult to guess a hand of the same artists in rather objective "Crusaders" (1903) and in such an abstract work, as "Composition VII", 1913, despite their common dynamics. Here - a constrained impulse, there - a liberated movement". 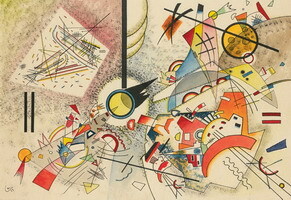 At the same time Kandinsky rendered tribute to literary activity. In 1912 "Concerning the Spiritual in Art" was published. Turning upside down the established idea about art in general, this book became the first theoretical foundation of abstractionism. 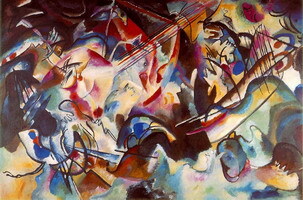 Having come to an idea, that "the purposes (and therefore, means) of nature and arts are essentially, organically and according to the laws of the Universe are various - and equally great... and equally strong", the artist proclaimed creative process of "self-expression and self-development of spirit". 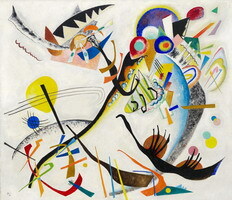 Besides, Kandinsky wrote memoirs "Steps" (1913); in Russian translation - Stairs), the collection of verses Sounds (1913) with 55 black-and-white and color lithographs. 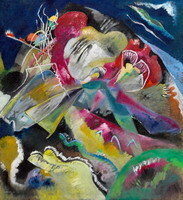 When the World War began Kandinsky was compelled to leave Germany. On August, 3rd, 1914 he and Gabriela moved to Switzerland where Kandinsky started to work on the book about "point and line". By November of the same year they had parted. 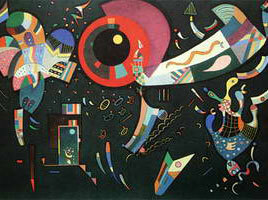 Gabriela came back to Munich, and Kandinsky went to Moscow. 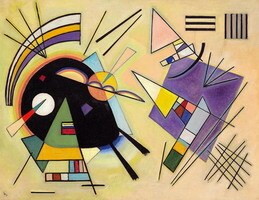 In the autumn of 1916 Kandinsky got acquainted with Nina Andreevskaya, the daughter of the Russian General, and he married her in February, 1917. 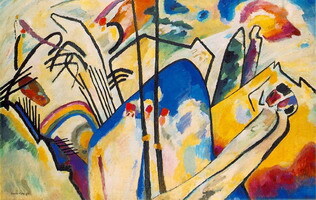 During these crisis years of revolution Kandinsky alternated among half-abstract idiom, Impressionist landscapes and romantic fantasies. 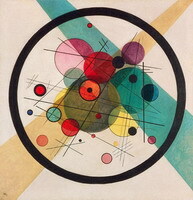 In his abstract pictures geometrization of separate elements became stronger, the reason for that is, first, the proper process of simplification, and, secondly - the Avant-Garde artistic atmosphere of Moscow of that time. 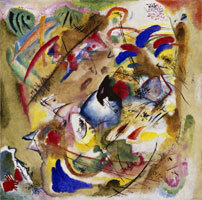 In Russia Kandinsky was in the vein of the post revolutionary cultural and political development. From 1918 till 1921 he cooperated with ISO of Narkompros (People's Committee of Education) in the field of art training and museum reform. 1919 and 1921 he published six big articles. As Chairman of the State Purchasing Commission at the Museum Bureau of the ISO Department of Narkompros he participated in founding twenty two provincial museums. But Kandinskt renders the biggest influence as a teacher of the Moscow Svomas (Free Workshops), and then Vkhutemas. Being its Professor since October, 1918, he designed a special curriculum based on the analysis of color and form, developing the ideas stated in On the Spiritual in Art. 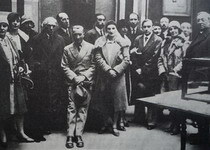 Then, participating in the foundation and management of the Moscow Institute of Artistic Culture (Inkhuk) he designed a curriculum for it, based on his theory. However, his opinion differed from the opinion of the Board of the Institute. 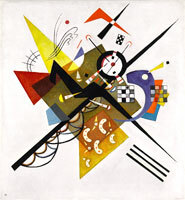 Kandinsky's opponents - Rodchenko, Stepanova and Popova - are for the exact analysis of materials, for their constructive arrangement and setting. Any display of irrationality in creative process was emphatically denied. 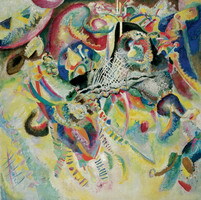 Kandinsky, in his turn, vigorously opposed the Constructivist opponents: "Just because an artist uses 'abstract' methods, it does not mean that he is an 'abstract' artist. It doesn't even mean that he is an artist. Just as there are enough dead triangles (be they white or green), there are just as many dead roosters, dead horses or dead guitars. One can just as easily be a "realist academic" as an "abstract academic". A form without content is not a hand, just an empty glove full of air". 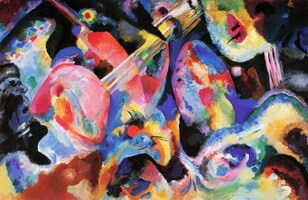 The unceasing attacks of his colleagues-artists considering his works as " mutilated spiritism " (Punin) were a determinative for Kandinsky to leave Moscow in December, 1921. The pressure of socialist ideology upon the art, which led eventually to appearance of socialist realism, began after 1922. 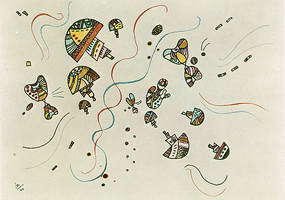 Kandinskii's pictures for many years are put away from the Soviet museums. 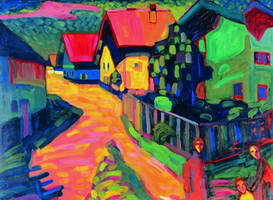 After returning to Germany, Kandinsky accepts an invitation of Walter Gropius, the founder of the well-known Bauhaus (the Higher school of construction and art designing) and he and Nina moved to Weimar where Kandinsky headed a fresco workshop. He again taught and developed the ideas. They dealt, first of all, with the deep analytical studying of separate elements of a picture, which resulted into "Point and Line to Plane" in 1926. 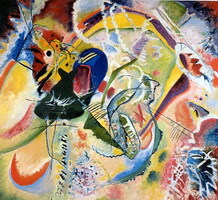 Kandinsky also worked much and experimented with color, applying his analytical foundation and the conclusions in his teaching. 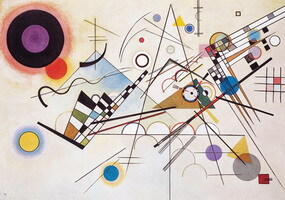 Kandinsky's works again underwent changes: individual geometrical elements increasingly entered the foreground, his palette was sated with cold color harmonies which, at times, are perceived as a dissonance, the circle is used differently, as a sensual symbol of perfect form. 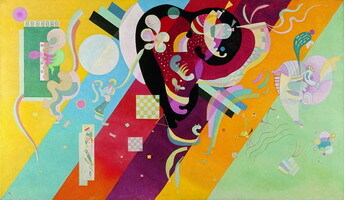 "Composition VIII", 1923 is the main work of the Weimar period. Alongside with conceptual works, at this time he created Small Worlds rich in fantasy for Propilei Publishing House and some chamber, "intimate" pictures, such as "Small Dream in Red", 1925. 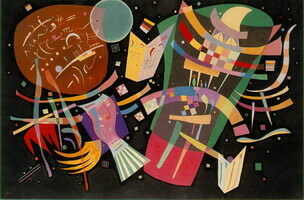 Also Kandinsky lectured and exhibited in the USA, having established together with with Feininger, Javlenskii, and Klee "Blue Four". In 1925, due to the right wing parties' attacks Bauhaus in Weimar was closed. 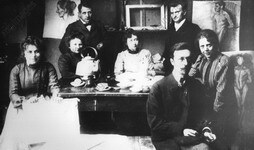 The second period of Bauhaus in Dessau began in quite favorable conditions: Kandinsky and other artists conducted some free classes of painting where they, besides teaching, could paint freely. 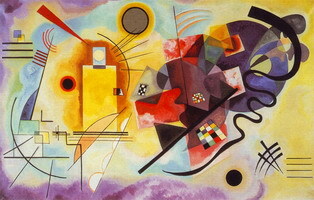 "Yellow-Red-Blue", 1925, is one of the significant works describing a stage of "cold romanticism" in Kandinsky's painting. "A circle, which I use recently so often, could not be called otherwise but romantic. And the present day romanticism is essentially deeper, more beautiful, more substantial and more salutary - it is a piece of ice, in which fire is burning. 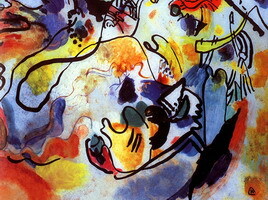 And if people feel only cold and do not feel fire - so much the worse for them..." In Dessau Kandinsky with a new force was carried away with romantic ideas of "Gesamtkunstwerk" (an idea of synthesis of arts in one work). These ideas were embodied in Yellow Sound and in graphic support of Mussorgskii's Pictures to the Exhibition. 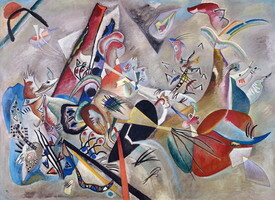 Kandinsky's painting of the last years in Bauhaus was penetrated with ease and strange humour, which again would be shown in his late Parisian works, For example, his picture "Capricious" (1930) can be possibly referred to them, it evokes some cosmically Egyptian associations and is filled with fantastic symbolical images in the spirit of Paul Glue, the artist with whom Kandinsky made friends at that time. About 1931 national socialists started a large scale campaign against Bauhaus, which led to its closing in 1932. 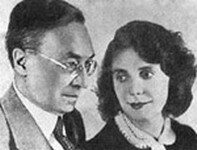 Kandinsky with his wife emigrated to France where they took up their residence in a new house in the Parisian suburb Neuilly-sur-Seine. 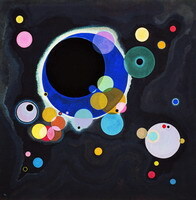 Between 1926 and 1933 Kandinsky painted 159 oils and 300 water colors. Many of them, unfortunately, have been lost after Nazis declared Kandinsky's and many other artists' paintings to be "degenerate". 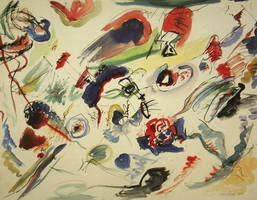 The Parisian artistic environment turned to be reserved to Kandinsky's presence. The reasons for that were his isolation from foreign colleagues and absence of recognition of abstract painting in general. As a result of this the artist lived and worked lonely, being limited to socialize only with his old friends. At this time the last transformation of his painting system happened. 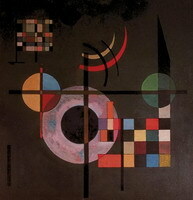 Now Kandinsky did not use a combination of primary colours but worked with soft, refined, subtle nuances of colour. Simultaneously, it supplemented and complicated the repertoir of forms: on the foreground there appear biomorphic elements, which feel at ease in the space of a picture as if floating all over the surface of a canvas. 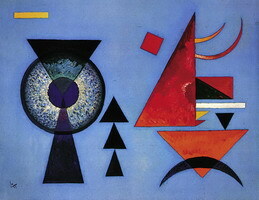 Kandinsky's pictures of this period are far from the feeling of "cold romanticism", in them life seethes and boils (see pictures "Sky Blue", 1940, "Complex-Simple", 1939, "Colourful Ensemble", 1938 etc.). The artist named this period of his creativity to be "really a picturesque fairy tale". During the war-time period because of the shortage of materials the formats of his pictures become ever less, up to that moment when the artist was compelled to be content with gouache painting on cardboards of a small format. And again he confronted with aversion of the public and colleagues. 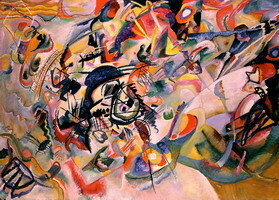 And again he developed and improved the basics of his theory: "Abstract art places a new world, which on the surface has nothing to do with "reality," next to the "real" world. Deeper down, it is subject to the common laws of the "cosmic world." And so a "new world of art" is juxtaposed to the "world of nature." This "world of art" is just as real, just as concrete. For this reason I prefer to call so-called "abstract art" "concrete art.". 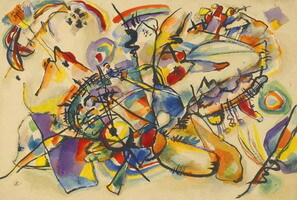 Kandinsky up to the very end had not doubted his "inner world", the world of images where the abstraction was not an end in itself, and the language of forms was not "deadborn"; they arose from will to pithiness and vitality.